If you’re keeping track of the news to see how Brexit is progressing, then the only possible answer (whatever your political persuasion) is… not well. MPs have vetoed the PM’s deal (again), the Speaker has vetoed her plan to make them vote on it again, the PM has been forced to ask the EU for an extension, and the French PM has said he won’t agree to one. With 9 days to go, we still don’t know what’s happening, and whether we will crash out of the EU without a deal (even though Parliament voted that wasn’t what they wanted). Since there is absolutely nothing ordinary people can do about any of this, I have decided the only thing to do is to head outside and get the garden producing food. 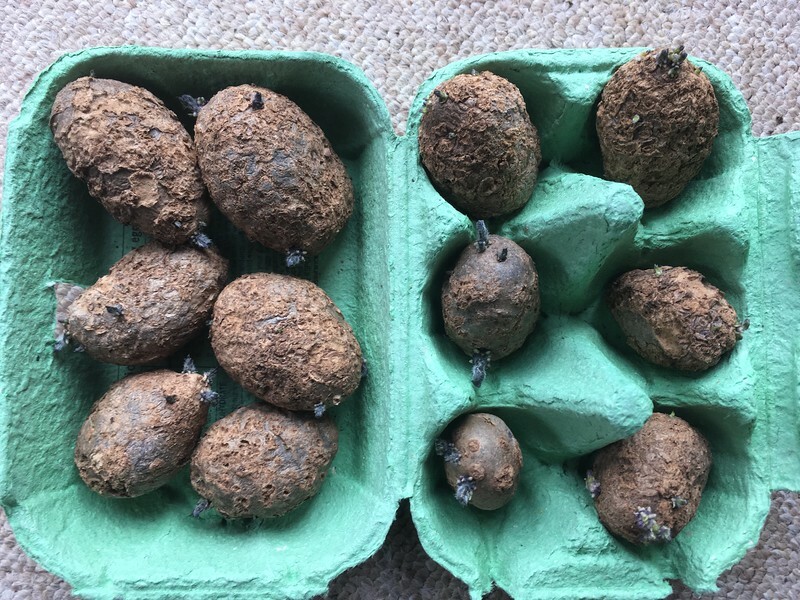 In January, I bought my seed potatoes – two varieties this year – and then realised they were both maincrops. We have been eating the end of last year’s potato crop, which were Blue Danube, an early, blight-resistant Sárpo variety. It wasn’t a good crop; since the summer was hot and dry and I’m lousy at watering, the potatoes were very scabby. A couple of weeks ago I decided that they may make better seed potatoes than eaters, and popped a few on the windowsill to chit. This they obligingly did, so on Monday I planted up three crates of three Blue Danube potatoes. It’s a little bit early, but I wanted to do something, and I have put the crates round the side of the house (with the wormery) where they will be protected from any really cold snaps. Today I have been sowing seeds. I sowed my first batch at the beginning of March, and I have leek, PSB and some sweet pepper seedlings on the living room windowsill. 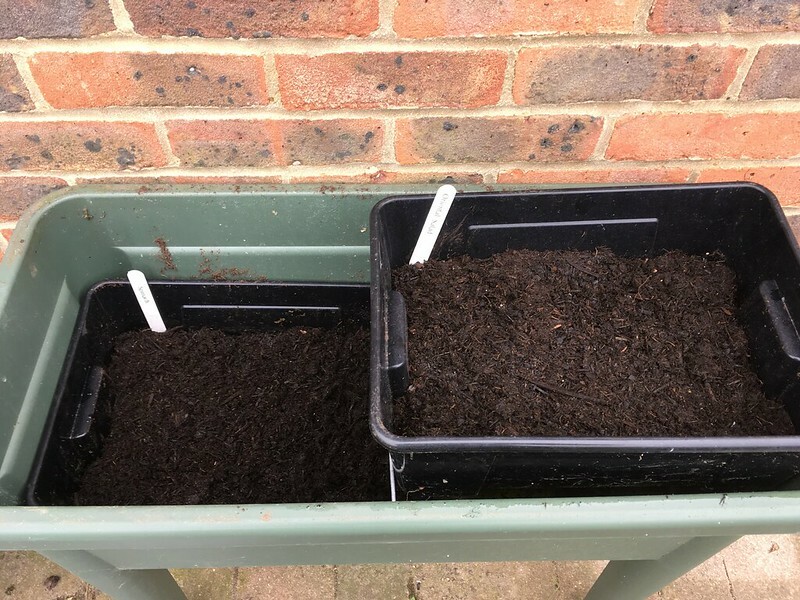 I sowed small tubs of salad and spring onion seeds at the same time, and when the seedlings came out I put them out into the cold frame to get more light. Within a couple of hours, Storm Gareth had blown the cold frame over and dumped my seedlings on the floor. So today I have re-sown those tubs with spring onions and salad, and they’re safely in the shed for now. 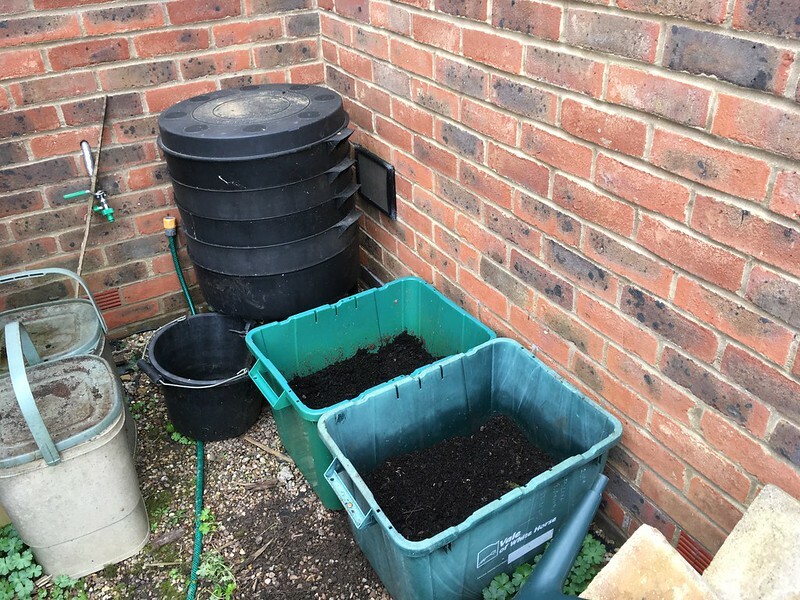 I have also sown two larger tubs – one with spinach and the other with pak choi. The spinach is in the cold frame (but it’s heavier, and the wind has died down, so fingers crossed…) but since they didn’t both fit, the pak choi are in the shed as well. Every time I go outside I pull up a handful of weeds and put them in the green waste bin, but if they’re edible (dandelions, hairy bittercress…) I do wonder whether we will be glad of them soon. On the other hand, I’m still harvesting leeks, and the purple sprouting broccoli is raring to go, so – in the garden at least – things are looking up. If you’d like your own copy of my shiny new zine, Keep Calm and Grow Food, it’s available via my Etsy shop. There’s more details about it here. Great blog post! Growing your own food is so satisfying. Are you planning on growing any beans this year?